Gone is the stigma attached to daytime hotel rentals--these days, more hoteliers see it as a way to increase their revenue and profit. 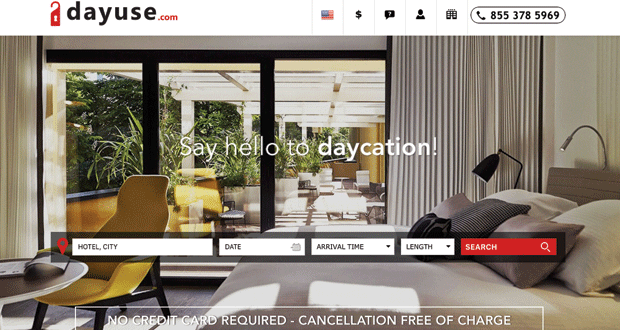 Dayuse, a Paris-based daytime booking platform making its way into the U.S., offers reduced rates for guestrooms during the day and up to 75 percent off of regular overnight prices. Given the increasing trend of leisure daycations, through Dayuse, the guest can book a hotel room for the daytime without requiring a credit card, as payment is directly exchanged at the hotel. The platform provides rooms to travelers who are searching for a place to rest during a layover, a second office, or somewhere to freshen up while on the go. Typically, 70 percent of hotel rooms are unoccupied during the day. Dayuse allows hoteliers to book rooms twice daily. From this additional revenue source, hoteliers are able to increase their hotel profits by 10 percent or greater, positively impacting their bottom line. Guests typically arrive in the afternoon or at night and simply rest in a hotel, so the hotel tends to be empty and fully-staffed during the day, says Lorenzo Sciotti, the U.S. head of sales for Dayuse. We have provided a solution for this. Because Dayuse clients check into the hotel during the day, that also creates increased use for a hotel's facilities, Sciotti explains. It's an additional revenue stream, so we're not just talking about all of the rooms, but also the products and services the hotel has to offer, Sciotti says. It could also be meeting rooms, which is something that we will be launching shortly in the U.S. We are really catering to not only the needs of the leisure clientele, but the business clientele as well. When the platform is first introduced to hoteliers, Sciotti says it takes some time to help them understand they are selling a unique product to potential customers. Since hotels have been launched, they have been used to selling overnight stays, Sciotti explains. So they need to transfer to a different mindset, which is capitalizing on those empty rooms and unused resources during the day. To date, Dayuse's services are available in 100 cities in 14 countries, and the company has assembled 80 partners in U.S. cities, including New York, Chicago, and Miami. Stateside users already account for 15 percent of the total number of Dayuse users worldwide, and the company anticipates elevated success in 2016, with plans to operate in all major U.S. cities. The goal, Sciotti, says, is to have a global presence by the end of the year.